A black and white negative Corbett (Corb) Stiner (right) and an unidentified man taken in front of Lakeside Motors on March 23, 1939 in Whitby, Ontario. In this view they are both wearing hats. 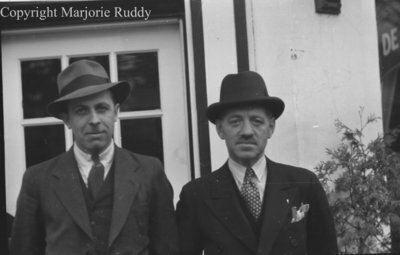 Corbett Stiner and Unidentified Man, March 23, 1939, Marjorie Ruddy. Whitby Archives A2013_040_870D.